Hello Storylovers! We are happy to share with you another children’s story with beautiful illustrations! Oki’s Heart is the story of a little girl who must go on an adventure of the Heart and Spirit in order to save her village from a giant wave – a tsunami. With the help of the Ocean Spirit, the Wind Spirit, the Earth Spirit, and the Fire Spirit, Oki must discover and awaken the power within herself to help her village out of danger. Although this is a children’s story, it is meant to inspire also adults and everyone who is open to experiencing more Beauty and Inner Spirit in storytelling. Please enjoy it with your family, friends, and most importantly SHARE this story with others online so that many more shall experience the same Inspiration and Wonder. 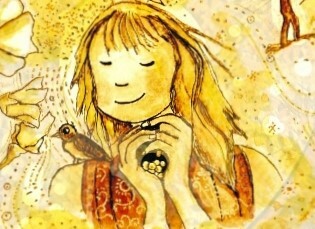 To listen to other stories, please visit the rest of the website at http://www.storyyoga.wordpress.com, including stories in Russian, German and Italian, with more languages to come! Next postStoryYoga in Italian and German!